Discussion in 'General Discussion' started by Buds, Feb 12, 2019. Event starts tomorrow. What's everybody's teams lined up for the event? Leaning toward something like this, depending on late layouts. 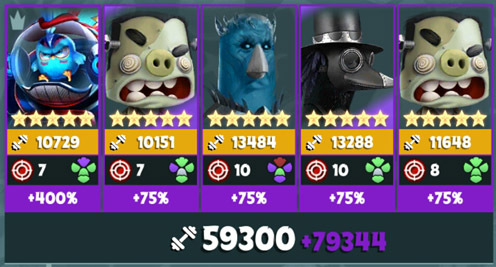 Well this would be my strongest team event boost wise at the moment, although I could certainly take them or others even higher totem and rune wise, but I doubt I'll use this combo. Knowing me I'll still run my master claude-contagious at lead and then some blend of those in the pic along with Dedsw1n3 or my maxed Lil P drive by. Tons of options with my flock. 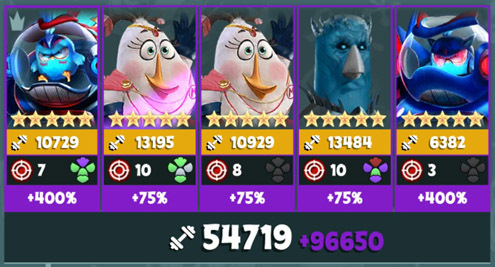 Funnily enough, my Master Matilda is now my strongest bird, even if I got her in the latest Matilda event. So that means you're taking down 85 this time right?? Depends on the layouts, really─if they'll be against blue birds but in favour of white birds, then I sort of have some backbone? Well best of luck to you, hope it happens! That will be a start May swap in Ded for the lower Matilda if more crowd control needed. I really want that rune this time. My P.7 Claude needs something! About this time last week I declared myself “screwed” for not having any Billies in my lineup and a “weak” team with 75,000 power. Then I finished level 85 with 81,000 power. Lesson learned. I will give it a shot again this week. This is my strongest team. Buds, I think this is your week! Without hatching I can get to around 140K with 2 Angromedon, 2 Master Matilda, and Frost. I am not sure how practical this combo will be until the event. Master Annie will come in handy with the health boost and its usually SS. Hopefully! I want one legendary rune then I can die happy. There's a Matilda in your team at 13K power when there's a Matilda in your inventory with 20K power? The Matilda used and the Matilda have different rune and SS timers. Use deadswine as a ref. U will know the one in my current team is stronger.